The seizure of asylum seekers’ assets in Denmark confirms that the state sees refugees as economic burdens by default, but this new bill makes them dependent by design. 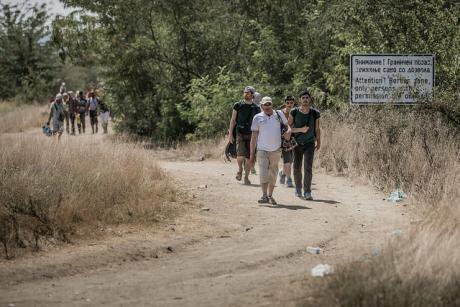 People crossing from Greece to Macedonia on 8 August 2015. Stephen Ryan (IFRC)/Flickr. (CC 2.0 by-nc-nd). Denmark has been in the headlines in the past weeks for passing a controversial law on seizing asylum seekers’ assets, allegedly a measure designed to offset the cost of the newcomers’ upkeep using their own wealth. Migration minister Inger Stoejberg rationalised the policy by stating that “those people who can manage by themselves shouldn't have assistance from the state”. Indeed, the imposed threshold of 10,000 kroner (£1,000) is in line with welfare rules for Danish nationals, which require the sale of personal assets exceeding this amount to receive state support. As such, the policy is presented as a way of reaching some sort of levelling between all benefits recipients in Denmark, irrespective of their origins. Equality of the poor, in essence. Of course, the reality looks quite different. Migrants may from now on receive the same amount of economic support as Danish nationals, but unlike their alleged Danish counterparts they remain excluded from all that could bring about change to their situations. Permission to work is categorically denied for the first six months, while their lack of Danish language skills and embedded social networks makes access to informal work, education, and other training facilities very difficult. Now migrants must also part from the one thing that may empower them – their economic resources. In essence, this policy is the operationalisation of a credo many share but few openly state: that all incoming asylum seekers are and will be a burden on society by default. As such, it submits 21,300 people – all the asylum seekers who entered Denmark in 2015 – to the same welfare policy, regardless of their individual capabilities, economic assets, or professional backgrounds. At the risk of stating the obvious: migrants are not all the same. Different asylum seekers have different assets, different needs, different capabilities. But under Denmark’s new law, which allegedly ‘evens out’ economic differences to avoid ‘refugee benefits scroungers’, every migrant is made poor and dependent from the state across the board. By assuming dependency the Danish refugee bill is actually creating it. It should not have come as such a big surprise when David Folkerts-Landau, the chief economist of Deutsche Bank, announced last December that “the refugees are the best thing that’s happened [to Germany] in 2015”. By then one million migrants had entered Germany – fifty times the number of people Denmark had welcomed that year. Folkerts-Landau, who is hardly a left-wing idealist, was speaking about the predicted impact of the new arrivals on the German economy: increased state spending, increased purchasing power of a growing population, long-term increase in the much needed labour force. It is important to acknowledge how migrants animate economies, not just those of the countries in which they settle but also those of the countries they transit; economically fragile countries like Greece, Macedonia and Serbia. Making migrants’ economic contributions visible means acknowledging their role as economic actors in society, an exercise which proves just how misled the Danes’ new bill is. Indeed, the economic gains of the so-called European refugee crisis are already visible. This truth has been brought home to me as I have accompanied migrants along the Western Balkans route. On the Greek island of Lesvos – regularly in the news for migrants’ deaths at sea, rescue operations, and deplorable conditions in the local refugee camps – an entire economy has developed around the new customers. Local restaurants display their menus in Arabic; phone chargers and power batteries are on sale at every street corner; gloves, hats and scarves can be bought at local news agents; and taxi drivers now boast of a thriving business in the usually calm winter season. At the same time, Victoria Square in Athens is not just buzzing with migrants. It’s buzzing with business. The main stopping off point for migrants on their way to northern Europe, the square has become the major trading centre for anything related to migration: travel agencies, money exchanges, the odd shower after or before a long trip, a coffee and a cigarette to wind down. Last November 60 to 70 busses departed daily from here for the Macedonian border. Each carried 60 or so passengers, each charged around €40 per person: Greek entrepreneurs were making up to €168,000 a day on bus transport from this one square alone. Even the petrol stations dotted along the route from Athens to Macedonia have tailored their services to the new, apparently good customers. Signs in Arabic display wifi passwords, phone recharging services, and the sale prices of jumpers and rain jackets. On the Macedonian side of the border hundreds of taxis await migrants to take them to Serbia. At the Serbian border village of Presevo I met a young man in his thirties who told me how he used to earn €200 a month with a small café he owns on the central square of town. “Now with all these refugees I organise a bus to Croatia and make big money”. Smiling, he pulls several thousand euro in cash out of his pocket. The money speaks for itself. Some of the migrants who arrive in the EU – be it Denmark, Germany or anywhere else – have money. But since when has owning wealth – be it cash or jewellery – been a problem, especially in today’s consumerist societies? On my trip I met a Syrian man traveling alone with his four-year-old daughter. He is a businessman who worked for years in Dubai. He was aiming for Denmark, to join his wife whose family reunification appeals after two years had still taken the family nowhere closer. The image of the helpless refugee could not fit less. Indeed, I felt it deeply disrespectful of my travelling companion that everything he had achieved, measured in money, would be taken away from him upon his arrival. Not only forced to leave his country, he is now forced to live off benefits. Besides the various moral considerations that have been invoked on this issue, this policy does not make economic sense. My friend’s wealth, which under different circumstances could provide the basis for a small business, will be stripped away from him – asylum seeker status in return for forced economic dependence. I once spoke to an Iraqi man who had been queuing for seventeen days to register at the LaGeSo refugee registration centre in Berlin, the first step towards a temporary resident and work permit. He was clearly worn out and tired of the senseless waiting, of the waste of time, of the cold, of the lack of reliable information. In an attempt to comfort him I told him “well, at least here you have free food, second-hand clothes, and medical support”. He looked at me, incredulous, almost contemptuous: “I want to work. I have had to turn down three job offers because of this [waiting]. I want to earn my own money, pay my own taxes and my own flat”. What determines migrants’ ability to succeed in a new country is not the amount of financial support they receive from the state. Rather, it is the chance they will be given by their hosts to make the most out of what they bring, be that money, skills or an entrepreneurial spirit. Submitting all asylum seekers to policies designed in accordance with those aimed at national benefits recipients does not mean that the state recognises the needs of all people in its territory equally. It means that the state has given up on migrants even before they arrive.